I'm a granola-eating, tree-hugging, squirrel-loving hippie. - Memorize Your Lines and Try Not To Bump Into the Furniture. I'm a granola-eating, tree-hugging, squirrel-loving hippie. Just joking. I loathe squirrels (rats with fluffy tails). I tolerate trees (they are outdoors). But granola... I admit it. I really do love granola. Over the years I've posted some really, really good recipes, not all of them good for you. Tasty, but calorie-laden. (Other recipes can be found in the tag cloud to the right over there, just click the word 'recipes.') But this granola, it's pretty good for you! My mother has been making this recipe for years. It goes back to when she nutritionally flipped out in the early eighties and began eating bean sprouts by the bushelful, sticking wheat germ in everything, and trying to pass off carob as chocolate. Carob, my friends, is not chocolate. I love you Mom, and I'm glad you eat the real stuff, now. Life is too short for carob. Put that on a t-shirt. 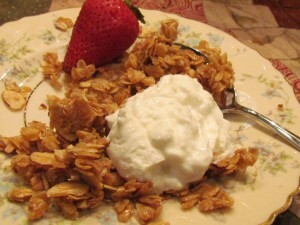 Anyhow, this recipe makes lovely, nutty, crunchy, clumpy granola that pairs well with Greek yogurt, another of my loves. Roughly one-third cup of this stuff is 200 calories. 1 1/2 cups dried fruit, like Craisins, or chopped apricots or blueberries. Or raisins, if you like those horrid, brown, wrinkly things. 1. In a bowl, mix oats, almonds, brown sugar, salt and cinnamon. In a saucepan, melt the butter and honey. Whisk or stir in the vanilla. Pour liquid over the oat mixture. Stir gently with wooden spoon, finish mixing by hand. 2. Preheat oven to 300°F Spread granola in a jellyroll pan. Bake 40 minutes, stirring every 10 minutes. 3. Transfer granola-filled pan to a cooling rack. Cool completely. 4. Stir in your dried fruit. Seal granola in an air-tight container or Ziploc bags. 5. Store at room temperature for 1 week or the freezer for 3 months. You're on Doc Martin season 5, episode three? I'm so jealous. *envies* I'm awaiting episode 2 (in summer reruns) at the moment. I so love that cranky doc. I'm watching on Hulu Plus. That show cracks me up. So deadpan.